This is one of our favorite meals, from one of our favorite books. Not only is it ridiculously good, it’s also incredibly easy to make. The recipe is pretty basic, so you can add in whatever you like. We like to add a lot of veggies and I try to plan it for later in the week when I have odds & ends to use up. This time, it was broccoli, purple cabbage, carrot, shallots, garlic and sprouts. (OK, I bought the sprouts just for this.) 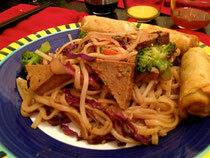 We also add marinated and baked tofu (a good basic marinade is in Veganomicon). In fairness, I was working from home today so I did the tofu earlier in the day, but even when I make it all at the same time, it’s still pretty easy – I just bake it while I prep the veggies. 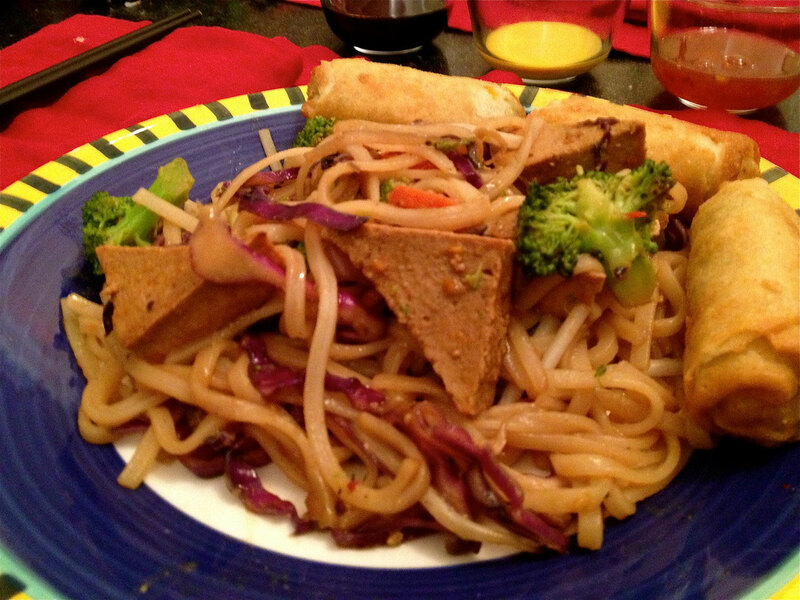 If you add a bunch of veggies and stuff to your Pad Thai, you need to double the sauce. I like to steam the broccoli and carrots and then add the shallots, garlic and whatnot to the wok and stir-fry it all, then add the noodles and tofu and toss with the sauce. A strange thing happened to the tofu this time – it turned a little grey from the purple cabbage combined with the brown from the marinade. Oh well. It still tasted good.